"So.. what's your favorite Spanish food?" Luke asked as we rounded the corner into Plaza Mayor. I scoured my brain for a good answer... something interesting and authentic that wasn't too typical like paella. But I came up short. "Um. I don't know," I said, before I could blurt out something stupid like "free tapas." How do you not know, I asked myself. You have been living in Spain for eight months and you don't have a favorite food?! Pull yourself together, Kelsey. I guess it was a good idea for me to be on the Madrid Food Tour that night. Not only to eat a ton of delicious tapas, but to also learn a little more about this city that I currently call home. Usually, I try to avoid playing tourist and I prefer exploring on my own, but this tour was something I had had my eye on for awhile. When my cousin Kristin was told last-minute that she'd be flying to Madrid for work, I was determined to make it happen for us. 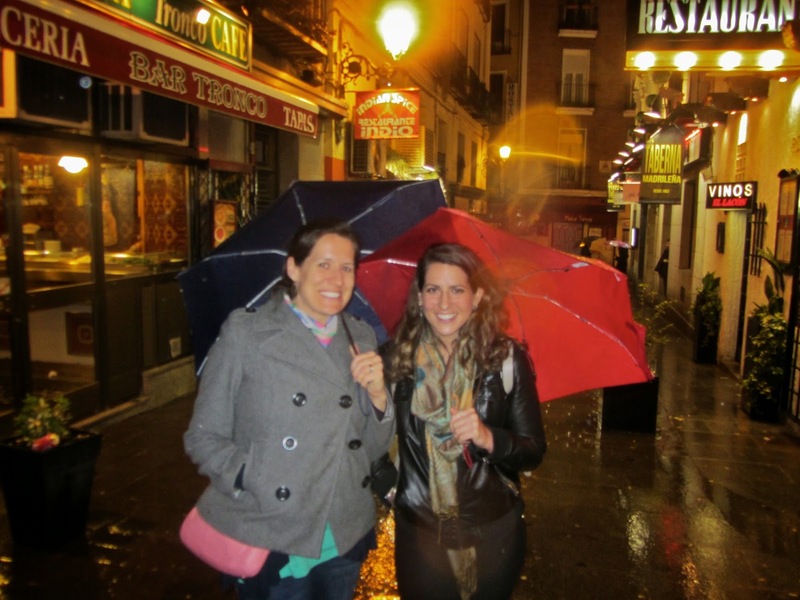 So on a rainy Saturday night in March, Kristin and I joined a small group huddled under umbrellas to bar hop around Madrid on a Tapas, Taverns & History Tour. 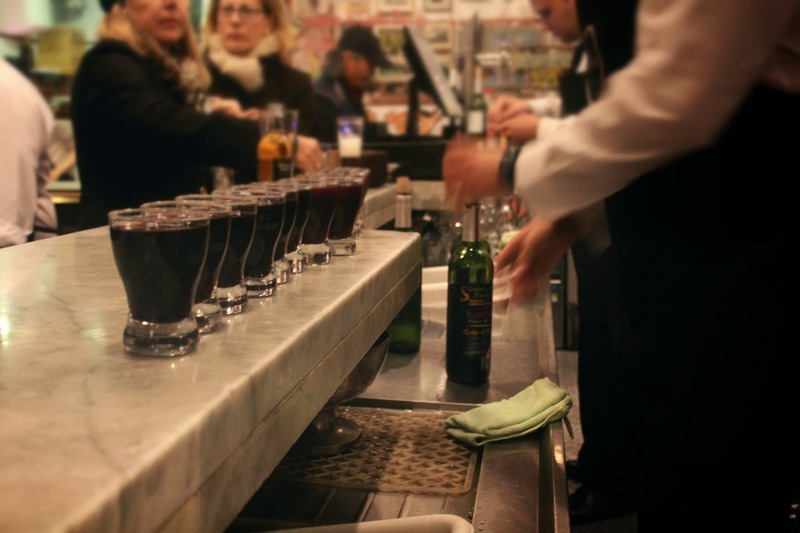 We were immediately pulled into a quaint, old bar to set down the umbrellas and enjoy a glass (or two.. or three..) of vermouth during introductions by our tour guides Luke and James. I had probably walked past this bar hundreds of times before and never even thought to take a look inside - not knowing what I was missing. Along with the vermouth, we wasted no time and started snacking on the traditional delicacies: cured Iberian ham, salted Marcona almonds, toasted bread with chopped tomatoes, Manchego cheeses, country olives, and more. "So, if you're wondering what to do with these olive pits.." James said to the group as he took one from his mouth and tossed it on the floor. "It's tradition." Many of the men laughed at this and joined in by throwing their pits under the bar, but Kristen and I hesitated. She had been collecting her pits in a napkin in her hand and said it just didn't feel right to throw it on the ground. But Luke soon noticed this, took the napkin from her hand and chucked it along with rest of the trash - well, if it's tradition! I think I would've been content if our tour had ended there, but we were just getting started. We ventured out to the next destination while our guides did their best to keep us dry without skipping a single historical sight or interesting tidbit along the way. Stomping through puddles in Plaze de Oriente, we found ourselves looking up at a statue of King Phillip IV on a rearing horse. It's based on a painting by Valezquez where the horse is standing on its back legs, explained our guides. In order to ensure that the bronze sculpture would balance, Galileo was called in to calculate the stability. He suggested to make the rear of the horse in solid bronze and the rest hollow. Surprisingly, the weight of the statue rests on its tail and hind legs. We continued on, twisting and turning down glistening cobblestone streets and crammed into a tiny old wine cellar from the 1800s. 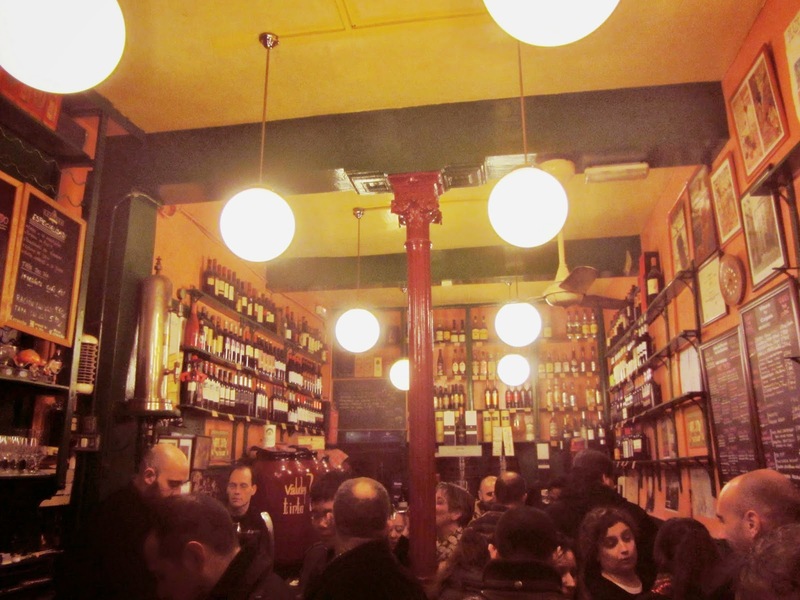 With standing room only, we cozied up to the bar with the locals and tasted a few more tapas: enormous meatballs, anchovies in vinegar, spicy chorizo and my absolute favorite - queso de cabrales a la sidra. This gourmet blue cheese from Northern Spain is blended with the signature cider from Astruias and generously spread across a slice of fresh bread. Each bite has an intense, tangy flavor that paired perfectly with the dry white wine chosen by the guides. And as the night kept getting better, our next stop was La Casa Del Abuelo. While I'd like to keep some of the tour destinations secret, this one is too good not to share. The restaurant was founded in 1906 and still holds that old charm. They specialize in gambas al ajillo, a delicious shrimp dish that arrives sizzling in garlic and olive oil. Soak up the oil with some bread and wash it down with their signature sweet Alicante wine and you'll be hooked. While the wine may be a little too sweet for some people on its own, combining it with the salty shrimp is a perfect pair. 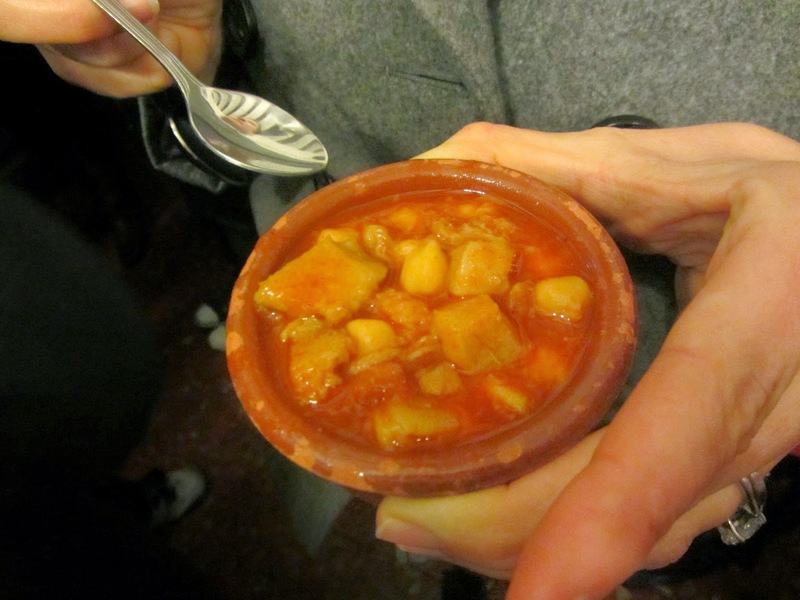 Another favorite dish was traditionally a poor man's food made from the wastes of the cow: Callos a la Madrileña. It's a hearty spanish stew of tripe, spicy chorizo, ham and chickpeas in a thick tomato sauce with a slight spicy kick. To balance out your diet with some green, I recommend the freshly grilled asparagus with a generous squeeze of lemon. We finished off the tour with chocolate crepes and sat down with a few pitchers of sangria to digest before calling it a night. My stomach was full of delicious foods, but also aching from laughter. Of course I enjoyed tasting everything and learning about Spanish history, but James and Luke's quick wit and good conversation really made the tour something special. Kristin and I both agreed that this was a wonderful way to spend an evening in Madrid. I really wish I had decided to take this tour much sooner to learn about the city, its history and discover the best dishes in Spain. Have YOU ever tried a food tour? If so, how was the experience? Comment below! 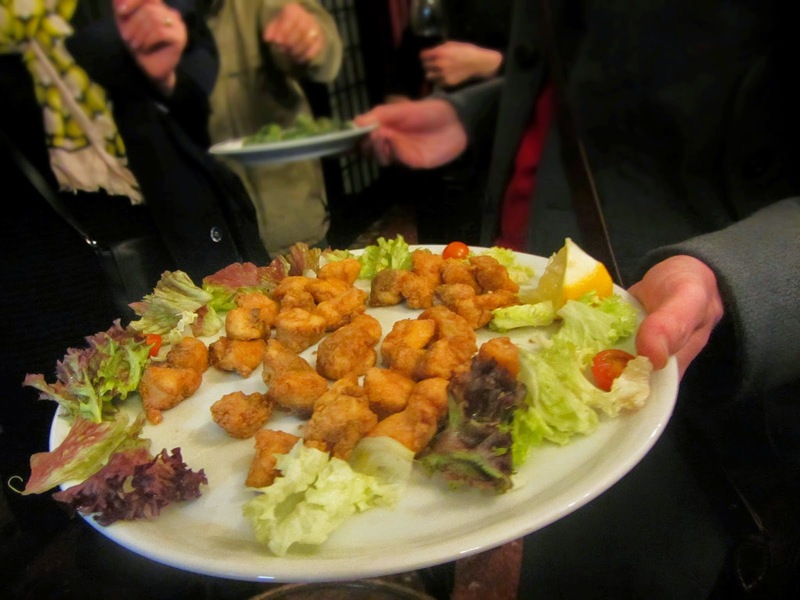 For more information about Madrid Food Tour and the many different tours and tastings they offer, check out their website. I'm dying to make it to one of their wine events! And if you want to start drooling, follow their posts on instagram. Lauren, MFT's owner and author of the blog Spanish Sabores, hosted my Tapas, Taverns, & History Tour in exchange for this post. As always, all opinions are entirely my own. I can't recommend the tour enough! Lauren certainly knows her food, and she knows Madrid! Beautifully written post! I had a blast on their Huertas Neighborhood & Market tour, so it's no surprise to me that their Tapas, Taverns and History tour is stellar as well. I'm dying to go on it! That queso de cabrales a la sidra dish sounds pretty amazing too. My mouth is watering just thinking of it! Yes, a delicious experience for sure. Highly recommendable! And you're right… chocolate + sangria is a perfect combo to end a night! OMG, i would totally love this, what a wonderful way to experience a city ....the food looks amazing, can I go now? haha yes, I'll go again with you! 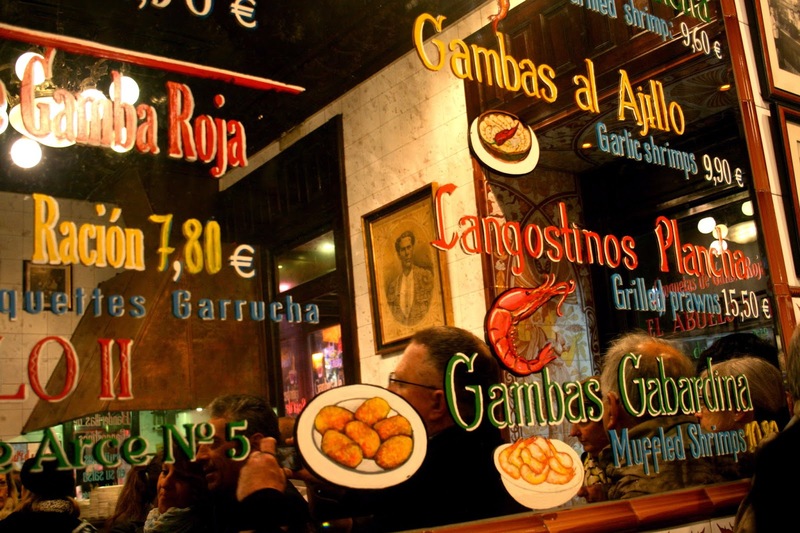 I adore food tours and Spanish food, this would be right up my alley! I highly recommend it if you're in Madrid! Hey there! I'm Kelsey. I'm attempting to create a life full of adventure and excitement. After living and traveling abroad for years, I now live a more settled life in Washington, DC while working in social media and traveling every chance I get. I'm a strong advocate for #WeekendWanderlust. Let’s adventure!